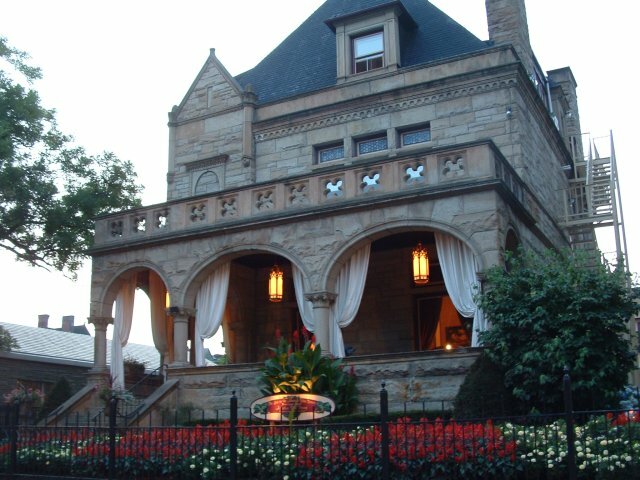 This Romanesque mansion was built in 1888 at a cost of $88,000 and was designed by H. H. Richardson, architect of the Allegheny County Courthouse. The owner was retail tycoon Russell Boggs who, with Henry Buhl, founded the high-end department store Boggs & Buhl (demolished in 1960 for Allegheny Center Mall). You will tour of the mansion, carriage house, courtyard and gardens. Be sure to ask about the friendly ghost that still plays in the ballroom of the mansion! The Boggs Mansion was built for Russell Boggs in 1888 by famed architect Richardson and his apprentice for a cost of $88,000.00 and now $3,000,000,00 in today’s money. It have been restored into a beautiful boutique hotel for guest to experience how a millionaire lived back in those days. Mr. Bogg’s fortune was made as owner of the famous Boggs and Buhls Department store on the Northside and sat where Allegheny Center stands. The mansion was his townhouse with 9000 square feet and complete with a third floor ballroom which now are guest room for the hotel. When he built his larger home in the suburbs of the city now known as Sewickley Heights, a much larger ballroom was in that home and he then converted the third floor ballroom into bedrooms for the staff. The home was ready for the wreaking ball when Jeff and Karl came along and saved it and turned it into what you’ll see today, the crown jewel of the Northside, home to the country’s most wealthiest people. We hope you enjoy the tour of the mansion, carriage house, courtyard and gardens.